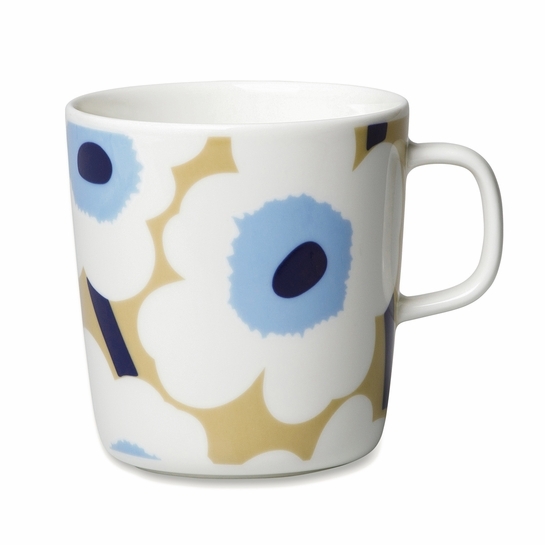 More about Marimekko Unikko Beige / Blue Large Mug Hold 13.5 oz of your morning coffee, afternoon tea or late-night hot chocolate in the Marimekko Unikko Black Large Mug. The porcelain piece is adorned with the poppies of Maija Isola's Unikko pattern in fresh shades of beige, blue, white and navy. Though bigger than the standard Marimekko mug, it is microwave, oven, freezer and dishwasher safe like the rest of the practical and beautiful Oiva dinnerware line. I LOVE the gorgeous pattern and the larger sized mug. An inspiring way to start my day with morning coffee! This is my second purchase. Itâ€™s just perfect for the cold winter days. I love how sturdy it is and easy to hold!